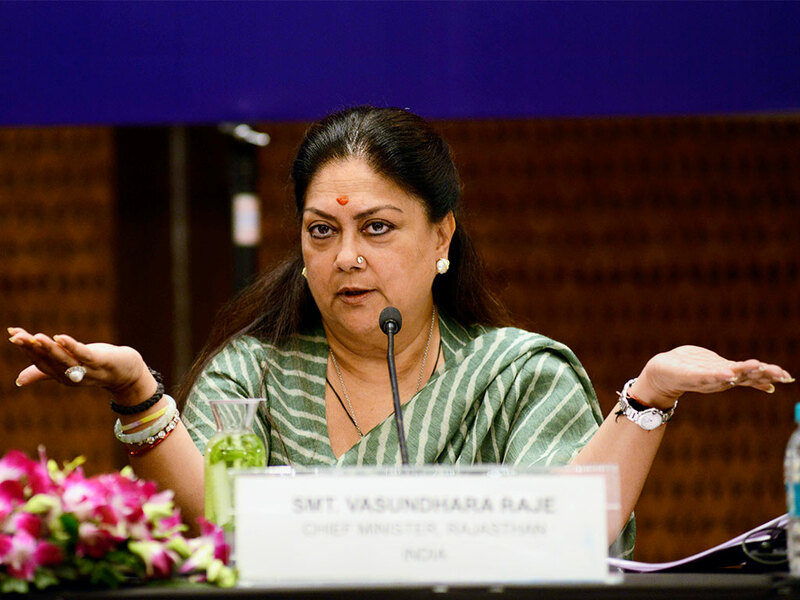 Following a Japanese industrial zone in Neemrana, Rajasthan Chief Minister Vasundhara Raje wants to create exclusive zones for investors from South Korea, China, Russia and Canada. She talks to Sahil Makkar about the rationale behind the reforms she has undertaken in the past two and a half years. BS. You recently visited Russia and invited industrialists to invest in Rajasthan. Is there a specific sector for which you are seeking Russian investment? VR: This was my first visit to Russia and it was a very positive experience. During my one-to-one meeting with G Poltavchenko, governor of St Petersburg, and D V Pasler, head of the government in Sverdlovsk region, we discussed areas of possible cooperation. Russia and Rajasthan can be partners in development of infrastructure, mineral extraction, urban planning, pollution control, defence manufacturing, heavy machinery and engineering sectors. We are also looking at significant participation from Russian companies at the Global Agritech summit in Jaipur in November this year and a delegation visit by the Chamber of Commerce and Industry of the Russian Federation soon. BS: Are you trying to make Rajasthan a preferred destination for foreign direct investment (FDI)? VR: Yes, of course. We are working towards making Rajasthan a preferred destination for investment, both domestic and foreign. Rajasthan offers a suitable platform for foreign firms to explore India as an investment destination. After the success of the first Japanese zone in Neemrana, the state government is developing a second industrial investment zone in Ghiloth on nearly 500 acres. We already have industrial giants such as JCB, Honda, Hero Moto Corp, Havells and Daikin, among others. We have abundant land; huge mineral resources; skilled and unskilled workers; proximity to Delhi, Mumbai and seaports; a sizeable market in the five neighbouring states; the Delhi-Mumbai Dedicated Freight Corridor (DFC) and the Delhi-Mumbai Industrial Corridor being built on both sides of DFC. We bought about a labour reform through amendments in the Industrial Disputes Act, Contract Labour Act and the Factories Act to create a balance between workers’ interests and ease of doing business. BS: When can we see Korean investment taking place in Ghiloth? VR: The Rajasthan Government is in talks with various Korean companies, which are evaluating the feasibility of their investment plans in the Korean investment zone. We are keen to setup more country-specific zones. Apart from Japan and Korea, we are reaching out to China, Russia, Canada and Italy. BS: Rajasthan recently received investment proposals worth Rs. 3.5 lakh crore. What is the progress on actual investments? VR: Currently, a large proportion of proposed projects is in various stages of implementation. For example, land has been identified for nearly 70 per cent of investment proposals, civic work has been initiated for 69 projects, and production has started on 16 projects. BS: What is the progress on the smart city project? VR: Jaipur and Udaipur were among the first 20 cities the Centre shortlisted for developing smart cities, with Jaipur ranking third and Udaipur 16th. A total investment of Rs. 2,401 crore has been proposed for Jaipur and Rs. 1,222 crore for Udaipur. With a huge funding ratio of 5:3:2 between the Centre, state and urban local body, respectively, the Union urban development ministry has released the first installment of Rs. 200 crore for Jaipur and Udaipur. The state has also contributed its share directly into the dedicated bank accounts of the respective special purpose vehicles, releasing funds of Rs. 186 crore for Jaipur and Rs. 159 crore for Udaipur to initiate development work. BS: In the past two and half years your government has carried out a raft of industry, labour, legal and land reforms. What was the objective? VR: We pursue industrial growth because it created direct and indirect jobs and provides us the wherewithal for delivering on social justice. Hence, economic growth, including industrial investment are not ends in themselves, but the means to deliver social justice. We have brought about a slew of reforms that would help improve governance and also facilitate industrial growth. Our labour reforms have been hailed as path-breaking and investor-friendly. Our legal reform process involves repealing, consolidating and examining the relevance of laws and then putting them online. BS: How does your government plan to bridge the fiscal deficit, especially with state discoms having the highest debt in the country? VR: Our deficit for 2016-17 without including discoms’ debt under the UDAY scheme could have been expected to meet the fiscal responsibility and budget management target of 3 per cent. That said, we are mobilising additional resources to keep the fiscal deficit within limits, with a focus on increasing our revenue receipts and reducing non-developmental expenditure. Under the UDAY scheme, the interest burden of additional liabilities on the state would be a manageable Rs. 5,200 crore approximately every year. VR: Since 2008-09, Rajasthan’s ratio of expenditure on education to aggregate expenditure has been higher than that of India average, except in 2012-13 and 2013-14. We have allocated Rs. 25,155 crore for the education sector in the current financial year. This represents a growth of 13.78 per cent from 2015-16. The draft Policy of Public-Private Partnership (PPP) in School Education has been prepared taking into consideration all major avenues of financing the improvement of school education, including PPP, government budget, corporate social responsibility, Bhamashah Yojana and Mukhyamantri Jan Sahabhagita Vidyalaya Vikas Yojana. We pioneered modifications to the Right to Education Act (RTE). Amendments to the RTE have ensured that now the state government has the responsibility to ensure attainment of class appropriate learning levels by all children in the 6 to 14 age group. Children will not be promoted to higher class unless they attain class appropriate learning levels. For the first time in years, the decline in enrolment has been reversed, with a 7.5 per cent increase in enrolment in Class I to XII in 2015-16. BS: You have announced PPP in health, education, power, tourism and solar sectors. Is PPP the only way forward? VR: We recognise that the private sector can introduce efficiencies in our welfare delivery mechanisms; PPPs are one way to harness this potential. We also want industry to be active investors in some of these sectors for their growth. The state government has joined hands with the private sector to run primary health centres and sub-centres. We provide inputs such as infrastructure, funds and medicines; the private sector brings in doctors, other staff and their services. This is as yet an experiment in 300 blocks – a subset of the universe of primary health centres. The results are encouraging. However, we are not depending solely on PPP to drive development and services offerings in these sectors. To improve universal health access we have introduced Bhamashah Swasthya Bima Yojana, through which more than 45 million people are benifiting from quality cashless health care facilities through private and public health care providers. The government will bear the cost of the premium for 10 million people. BS: You started an ambitious project for rain harvesting. Have the efforts yielded results? VR: Our state has 1.16 per cent of the surface water available in country; 4 billion cubic metres out of 16.05 billion cubic metres of rain gets wasted annually as run-off without being tapped. Around 70 per cent of drinking water and domestic supplies depend on groundwater. To address this issue, we launched the scientifically-designed Mukhyamantri Jal Swavalamban Abhiyan, the country’s largest water conservation campaign in rural areas. We began on January 27, with a target of 108,000 works related to water conservation in 3,529 villages. Of these, 91,043 works have been completed. You should see the joy in the eyes of the people when they see the water bodies getting filled with rain water. In phase II of this campaign, the water conservation process will be taken up in 3,500 villages.